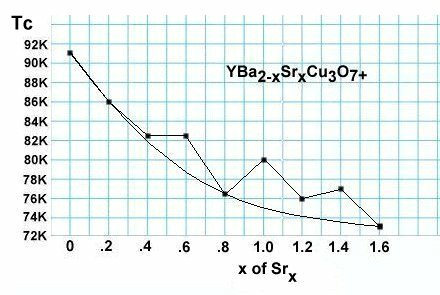 Superconductors.ORG reports an analysis of 14-year-old data(1) on Sr substitution in YBCO has revealed that the critical transition temperature (Tc) of superconducting copper-oxides can be improved by increasing weight disparity within the insulating layers. Previously Tc enhancement through planar weight disparity was found to occur only by alternating heavy insulating layers with light insulating layers; or by alternating heavy CuO2 planes with light CuO2 planes. (Click HERE for background on planar weight disparity). Sr.66 = (BaSr)-Y-(BaBa)-Y-(SrBa) = light-heavy-light. 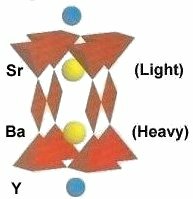 Sr1.33 = (SrBa)-Y-(SrSr)-Y-(BaSr) = heavy-light-heavy. Sr1.0 = (SrBa)-Y-(SrBa)-Y-(SrBa) = same-same-same. Although the 5-degree improvement in Tc at Sr = 1.0 is not sufficient to overcome the gross decline in Tc due to overall molecular weight loss, it does confirm that creating weight disparity within the insulating layers of copper-oxide superconductors is a viable tool for promoting Tc in theoretical molecules of the future. To date some 20 new superconductors have been discovered by incorporating planar weight disparity into molecular design. In the quest to understand the mechanisms of high-temperature superconductivity, the contribution of planar weight disparity may prove to be the most significant of all. (1) J. Golben and M. Vlasse, "Study of Bulk and Single Crystal YBa2-xSrxCu3O7+," Superconductor Science and Technology, vol. 5, pp. 231-235, 1992.